The One Year Anniversary of this Blog! I recounted here how I started this blog after going to an exhibit in January 2008 at the Municipal Art Society on Jane Jacobs. Jane Jacobs had been critically involved over the years at Washington Square Park (and, of course, New York City, in general). The goal of the exhibit was to inspire community activism. They handed out a little booklet which said, basically, if all else fails, if you’ve tried everything, START A BLOG. I recognized – from hearing their stories – that many of the people in the community had tried the typical routes (go to meetings, talk to politicians, talk to your community board, hand out flyers, etc. etc.). A blog seemed like something new, different. Right around the time I started, I met all these wonderful Brooklyn bloggers at a luncheon. They were all so inspiring, honest, talented, encouraging, quirky. Truthfully, if I had realized how much work it would be, I might have rethought it but this blog provided a place to practice writing in a structured way that was part activism, part journalism. I have a background in public relations so it seemed like some of that might get thrown in also. I started out wanting to tell the story of what had happened to that point. Then, last summer, new meetings about the park’s redesign began and I was able to report the story as it was happening. Curbed called this a “watchdog blog.” Along the way, this blog (and I) got written up in the New York Times, linked to by numerous other blogs and web sites, and had written dialogue with the NYC Parks Commissioner. When I first got started – to catch up – I surveyed video footage and scoured newspaper articles recounting the numerous meetings and lawsuits and presentations … oh my! … navigating a history of incomplete and often inaccurate information presented by the Parks Department, questionable decisions made by the local Community Board 2, Landmarks Preservation Commission and City Council, and political deceptions and maneuvering across the board. Catching up, the well of information seemed bottomless. I recognized early on that I needed to interconnect other issues going on in our city and public space that also relate to the issues at Washington Square Park. * Mayor Michael Bloomberg. Without him and his deft and slickly corrosive way of maneuvering through city agencies and outside groups, I believe none of what’s happened at Washington Square Park and in our city would have been possible, particularly at such an accelerated rate. -He and his policies are responsible for placing the interests of developers and corporations over neighborhoods and communities which has been a real detriment to the diversity and uniqueness that is (or should be) New York City. -The Mayor (with the assistance of Speaker Quinn and 28 City Council members) and the overturning of voted-in term limits is another issue I’ve covered in-depth since I started, believing it highlights our CEO Mayor’s arrogance, lies and sense of entitlement. So there you have it! I can’t say what the year ahead will look like. I believe there’s room for change in the NYC Parks Department’s plan for Washington Square Park – We’ll see! At least we’ll all know exactly what went down. I hope you will continue to send me your ideas, your feedback, your comments, your help, and your encouragement, and we’ll navigate the road ahead together. Guess what? Washington Square Park Blog is 1 year old on Thursday, February 26th! It’s true. This blog’s one year anniversary is this coming Thursday! I might have missed the 1 year mark if I hadn’t gone back to the archived February 2008 calendar to check. I thought the blog’s starting date was February 28th, but actually, it was February 26th, 2008 that I created the Washington Square Park Blog. I’ll write more about it that day. Thank you to everyone who has read regularly or stopped by now and again. Brooklyn DIY, a new film by director and artist Marcin Ramocki, will get its premiere Wednesday night, February 25th, at MOMA. When did you know it was over for Williamsburg? Was it the day the first luxury condo was sold? Or the first time you saw a Ramones baby onesie in a Bedford Avenue shop? In his new film Brooklyn DIY, director and artist Marcin Ramocki, whose recent project was the video game documentary 8 BIT, examines the creative renaissance that arose in Williamsburg in the early ’80s and the gentrification that forced out the artists who once settled there for the cheap rents—not the chance to purchase a $12 cocktail. film length: 75 minutes, discussion with the director and participants follows, $6 students, $10 adults. Take Back NYU – an Update and Request for Your Support. Contact John Sexton. Attend Rally at Washington Sq Park Border Tues. Feb. 24, 7 p.m.
Well, if you missed it, last week, students with organization Take Back NYU took over the cafeteria at the Kimmel Center* for close to three days. Among Take Back NYU’s goals demands are budget disclosure, endowment disclosure, and student representation on the Board of Trustees. Their action was very daring and difficult at a school like NYU which is helmed by John Sexton, a University President perfectly at ease during the Bloomberg era. NYU would never have gotten away with their endless expansion eclipsing neighborhoods throughout our city without the climate and structure put into place by our CEO Mayor. New School students recently held their own occupation of that school’s student center cafeteria in December with a much different outcome. New School President President Bob Kerrey (another controversial and not that well liked figure) negotiated and reached an agreement with the students. NYU, on the other hand, acted in bad faith. When four of the students from Take Back NYU left for a scheduled “negotiation” with NYU officials in another part of the Kimmel Center, instead of any negotiating, these students were detained and not allowed to rejoin the group. Police officers then broke down the barricade to reach the remaining students and evicted them. To grant amnesty for the participants involved in the occupation and the events related to it. To find a suitable replacement for the library and study space that will be lost with the closing of 65 Fifth Avenue. It was expressed to the students that this was already in the works, as we are completing work on new library and study room facilities at 55 West 13th Street. The construction of this new space will be completed in time for the start of the spring semester. To include student participation in the selection of the Provost. To establish a committee on Socially Responsible Investing for the University’s endowment. We believe that the agreement reached is reasonable and will improve the shared governance of our university. Today, 65 Fifth Avenue will resume normal operation for our students, staff and faculty. The students at NYU are in jeopardy of being suspended and have already lost their housing. 1. Rescind suspensions, dorm evictions and all other disciplinary action. 2. Drop all criminal charges. 3. Meet the students’ demands. Take Back NYU! is asking for support for the students at a rally Tuesday, February 24th, at 7 p.m. Washington Square South and Laguardia Place, at Washington Sq Park border, across from NYU Kimmel Center. Some really great revealing articles lately on CEO Mayor Bloomberg’s New York in which, as you know, only the financial market and corporate and developer Friends of Mayor Mike are given ‘breaks’ while everyone else has their public space reduced and privatized, continually monitored, and their neighborhoods and communities across the five boroughs sacrificed for these same FOMM. I’ll highlight some of the pertinent points from a few of these articles today and in the coming days. What follows is an excerpt from a most interesting article from the March 2009 Atlantic magazine, “How the Crash Will Reshape America,” by Richard Florida. He addresses NYC’s over-reliance on Wall Street and asks … what would Jane Jacobs say? In the short run, the most troubling question for New York is not how much of its finance industry will move to other places, but how much will simply vanish altogether. At the height of the recent bubble, Greater New York depended on the financial sector for roughly 22 percent of local wages. But most economists agree that by then the financial economy had become bloated and overdeveloped. New York is much, much more than a financial center. … Elizabeth Currid’s book, The Warhol Economy, provides detailed evidence of New York’s diversity. Currid measured the concentration of different types of jobs in New York relative to their incidence in the U.S. economy as a whole. By this measure, New York is more of a mecca for fashion designers, musicians, film directors, artists, and—yes—psychiatrists than for financial professionals. The great urbanist Jane Jacobs was among the first to identify cities’ diverse economic and social structures as the true engines of growth. … Jacobs argued that the jostling of many different professions and different types of people, all in a dense environment, is an essential spur to innovation—to the creation of things that are truly new. And innovation, in the long run, is what keeps cities vital and relevant. In this sense, the financial crisis may ultimately help New York by reenergizing its creative economy. … When I asked Jacobs some years ago about the effects of escalating real-estate prices on creativity, she told me, “When a place gets boring, even the rich people leave.” With the hegemony of the investment bankers over, New York now stands a better chance of avoiding that sterile fate. My Response to the Parks Commissioner! Regarding Washington Square Park. Thank you for your January 30th response to my letter outlining my concerns around the work being done on the redesign of Washington Square Park and the lack of responsible oversight by the NY City Council and other elected officials. Washington Square Park Plan: Extensive Review? First, the plan is not a “renovation” – which would signal repair, maintenance, ‘sprucing up’ – it is a dramatic re-visioning of this public space. Second, While there were many meetings around the redesign plans, those plans were often misrepresented by representatives of the Parks Department, the designer and others. The community members, Community Board, and Landmarks Preservation Commission were frequently given incorrect or insufficient information, and so thereby lacked the necessary information to effectively evaluate the Parks Department’s plans for the park. Third, “more review” is not meaningful if officials disregard the community sentiment (which I’ll address later in this letter). Instead, with New York City in a budget crisis, the budget for Washington Square Park’s redesign now stands at $27 million and counting — an increased cost of $11 million over the $16 million budgeted. The Park could have been fixed up without chainsawing trees and bulldozing parts of the Park for a much smaller (and more fruitfully used) expenditure. Washington Square Park, as you know, is a dynamic public space with a history of being used for protest, performance, art. This park invites unique and spontaneous interactions between the people who visit and utilize the park. The park is not lacking for green space. The Parks Department had allowed the lawn – as well as the walkways and bathrooms — to fall into a state of disrepair. When maintained properly and brought back to a lush state, the Park contains more than enough “green space” for the “passive recreation activities” you suggest, like picnicking and relaxing. Each park – as you know – has its own distinct personality and cachet. In my opinion, these elements ought to be respected and nurtured. * The interior plaza around the fountain — from outermost edge of fountain wall to innermost edge of any seating — was 27,650 square feet. * The PROPOSED interior plaza is 20,662 square feet. – A LOSS OF 6,988 square feet. * The entire (what is called the) exterior plaza (which includes and goes beyond the interior plaza) has been 51,223 square feet. * The PROPOSED exterior plaza area is 39,419 square feet. The “Gerson-Quinn Agreement” puts some mild monitoring on the Parks Department’s plans. Council Member Gerson and Council Speaker Quinn stipulated that the public space of the interior Fountain plaza would not be diminished by more than 10%. Clearly, there is a greater reduction than previously admitted. No further information has been provided by the Parks Department to allow anyone to ascertain what the exact reduction in space is. When I tried to get the information from the Parks Department’s press office, I was told it wouldn’t be a problem and then received no further information or return correspondence, despite following up on it several times. As far as the entire exterior plaza, no further information has been given on the reduction in space (other than the numbers above, which had to be obtained via one of the lawsuit’s brought against the city in relation to its plan). The November 23rd, 2008 New York Times article “The Battle for Washington Square,” reports that the Parks Department will be reducing the public area around the plaza by 25 percent. Is that acceptable to the community? No. Are our public officials monitoring this? Not that I can see. The fountain plaza’s reduction in size, along with the removal (currently planned) of four of the six seating alcoves and a reduction in space at the northeast corner and southwest corners (these are the ones you acknowledge), signify a significant reduction in “public” space – particularly the public gathering space for which Washington Square Park is renowned, any way you cut it. Would the additional grassy areas compensate for the reduction of the central plaza, as you suggest? And exactly how high will the fences around those “green spaces” be which are supposed to add to and compensate for the reductions in what is now an open central plaza? At the Washington Square Park Task Force meeting I attended on February 4th, the seating alcoves were discussed at length. You state that two – of the present six – alcoves are now being “included” as a modification to the original plan – in response to the Washington Square Park Task Force. One of the alcoves across from the playground is being retained in its entirety. From the ‘before and after’ diagrams shown by Parks Department landscape designer George Vellonakis at the meeting, the second alcove faces an unacceptable and dramatic reduction in size. These alcoves contribute to the uniqueness of the park; they are used by students, tourists, seniors, classes, and people who’d like to retire to a more private nook of the park while viewing what’s going on in the park. George Vellonakis stated that the plan is going to the Landmarks Preservation Commission on February 17th with just the “two” alcoves despite the fact that back in July 2008, the Task Force expressed the sentiment for keeping all the alcoves. I hope you will listen to the overwhelming public sentiment and retain these important spaces, in their current configuration. You claimed that I described the reduction in the chess area (Southwest corner) in “misleading terms.” Not so. Unfortunately, the size of reduction of this area is hard to determine. At the Parks Department presentation last week to the Washington Square Park Task Force, your department did not come prepared with figures, specs, renderings, or with a model – in other words, the Parks Department failed to present anything that would give a true presentation of the changes to the Park. Unfortunately, this has been the case throughout the entire project. The correct figures concerning the reduction in space should have been presented at the meeting. This was not done. You state that the center of the chess area is “generally empty” right now. An area may seem “empty” but other things occur within that space, thereby giving people options for congregating and interacting without feeling confined. Why must the Parks Department consider all unused space to be “useless”? The Northeast corner reduction also is problematic. On the diagram, this actually appears to entail quite a large reduction, not a “slight” one as you put it. But once again the Parks Department presented no figures, no specs. Why not? It was confirmed that all the picnic tables in the park are being removed. Why? Why can’t some picnic tables remain in the park? Why can’t there be areas for picnic tables? These changes amount to dramatic alterations of what has been a most successful public space – something you seem unwilling to acknowledge or respect. The Task Force has submitted notes on what they would like to see at Garibaldi Plaza to meet the needs of the Washington Square Music Festival and other “ad hoc” use. The Washington Square Music Festival is apparently willing to work with the lower stage if the size of the stage can be increased. Because of the way the area is currently constructed, the musicians and performers are able to use the “Teen Plaza” area as a ‘back stage’/holding area. Without consulting the Music Festival, the Parks Department decided to reduce the stage and not accommodate this additional need. And, yes, under community pressure the Parks Department agreed to raise the stage from the originally planned 22″ to 28″ although the previous stage was well-liked and well-functioning at 36″ Lowering the stage height limits the number of people who can properly hear the music played from the stage. There is a major reconfiguring of this entire area in Phase II of the Park’s redesign. Hopefully, the full information will be presented to the Landmarks Preservation Commission on the 17th. The community should get the same degree of respect and level of information. At this moment, it is woefully underserved. You state that the fence does not have “spears” but instead has “rounded balls.” Please! The fence is composed of spears with small balled ends soldered on top to reduce the number of accidental injuries. However, more important an ‘argument’ than spears vs. balls is the exact wording in the “Gerson-Quinn Agreement” which states that the exterior fence of the park should “preserve the park’s sense of openness and its inviting character” and that it should “consist of a decorative ‘delicate’ design.” The new fence does not do that – just the opposite! That is one example of where the Washington Square Park Task Force and our elected officials should be better monitoring these aspects. Hence, my appeal to the City Council. The old fence was a nice feature; people could lean or sit on the fence anywhere in the park; but now, with the four foot high fence at the exterior of the park and the post and chain fence in the interior, that is no longer possible, and the open, welcoming character of the park is destroyed. You say that 12 trees were “removed” for reasons of “declining health” (my count is 14). In April of last year I spoke with you at Morningside Park and asked about the trees at Washington Square Park. You told me the trees being removed were “all dead.” I knew that this was not accurate at the time and told you that there were only “four dying trees” which you then agreed was the accurate amount. The truth is that 6-8 of the trees removed lined the fountain and were not in “declining health” or “dead” — they were just ‘in the way’ of the Parks Department’s plan to unnecessarily move the fountain to align with the Arch. Although “new trees” – saplings – will be or have already been planted, they can never be equal to 40-80 year old mature trees, which we should work to preserve. 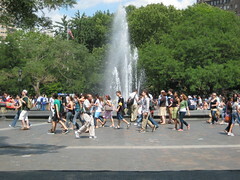 a) leave the central fountain plaza sunken; b) do not shift the fountain so that it is now off-center, though aligned with the Arch at Fifth Avenue; c) do not cut down healthy trees; d) do not sell off the fountain naming rights to the Tisch Family, or to anyone; e) leave the dog runs where they were; f) leave the fence at its existing 3 foot height; g) keep all or the majority of the seating alcoves; h) keep the height of the stage and provide better accessibility to it for wheel chairs. And more. None of these were accommodated. It makes me wonder: If the public’s input is not respected and the Gerson-Quinn letter is begrudgingly implemented at times, at your whim, who is the Parks Department accountable to? Shouldn’t input from our representatives and the community at large be taken significantly into consideration? Shouldn’t the Community Board (which later repealed its approval of the plan) have been told that this was, in your view, a “Non-Binding (Non) Agreement,” and that even most of its very mild revisions to the Parks Department’s plan, such as keeping the fence in character with the park, consulting the Washington Square Music Festival on design of the stage, making the bathroom renovation a “priority item,” making “reasonable efforts to salvage all healthy trees,” etc. were non-binding and would not be implemented? the public gathering space around the fountain being increased in size; retaining all of the seating alcoves; preserving the park’s remaining trees; reviewing and changing the fencing (interior and exterior); making the Garibaldi Plaza workable for the community and performing community’s needs; restoring the height of the stage to its full 3 feet; no Conservancy at this park; expanding the “plazas” to not have to be “uniform” but instead to fit the social character of this park. Each park is different. You know this. Let’s honor the changes to Washington Square Park made in 1970 and the spirit of the last century, as well as the previous one. Right now, the Park Department’s design is much too formal and disrespectful of that history and today’s needs. Perhaps there is a way to save money in the city budget at the same time while bridging some of the previous discord between the New York City Parks Department and the public. Thank you for your response and attention. Please feel free to contact me at any time. Will post when there is a new date! Landmarks Preservation Commission Public Hearing on Washington Square Park on Tuesday, February 17th * How will City’s presentation to LPC differ from bare bones presentation given to Community Board 2? The Landmarks Preservation Commission will hold a public hearing Tuesday, February 17th around the Parks’ Department’s plans for Phase II of Washington Square Park redesign. If you’d like to see the plans, they are available as of today (February 12th) at the LPC. The New York City Parks Department via landscape designer George Vellonakis showed some minimal “before-and-after” drawings of the plan to the Washington Square Park Task Force/Community Board 2 Parks Committee at their meeting last week (February 4). Of course, it is nothing new for the Parks Department to try to ‘get away’ with presenting the bare minimum (and obscuring certain facts and figures) but will the Community Board or Task Force at last object? How does the Community Board participate in the Public Hearing Process? [Applicant – in this case City of New York-Parks Department] must present your proposal to your local Community Board before the LPC public hearing. Typically you will appear before the Community Board’s Landmarks Committee; your presentation should be the same one that you use for the LPC. The Committee will then make a recommendation to the full Board, which will send a letter to the LPC stating that the Board supports, opposes or recommends modifications to the application. Failure to appear before the Community Board may result in a negative recommendation from the Board, and can delay the LPC’s final decision on your proposal. Community Board 2 Chair Brad Hoylman says the Community Board is working on a resolution which will be presented to the Landmarks Preservation Commission on Tuesday. It is unclear if that will be a resolution from : the Washington Square Park Task Force? Community Board 2 as a whole? the Parks Committee of CB2? the Landmarks Committee of CB2 ? All of the above? Mr. Hoylman also informed me that although the Landmarks Committee did not have its own presentation of the plan (it was on the committee’s agenda, and then subsequently removed) – and was not included in the February 4th meeting – that the committee has members who are also part of the Parks Committee (who will give input). I am unclear if that suffices. I was told by a member of the Landmarks Committee that typically when an applicant comes before the committee, the committee is shown: architectural renderings, examples of materials to be used, example of railings and how they are going to join, etc. In other words, much more detail. Since the Parks Department only showed minimal information at the Washington Square Park Task Force meeting on February 4th, will they be showing additional information to the Landmarks Preservation Commission? If so, is that acceptable to the Washington Square Park Task Force and Community Board 2? If you plan to speak at the Landmarks Preservation Commission, please consider orienting your comments to the historical, cultural, and aesthetic aspects of the park’s design plan. Materials available for Public Viewing in advance as of today, Thursday, February 12th. I will update with the time once announced.